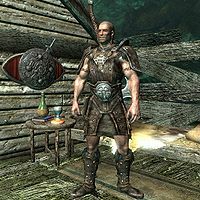 Captain Hargar is the Nord leader of the Blackblood Marauders residing in the caved-in Broken Oar Grotto. He wears leather armor with matching leather boots. He wields a leveled two-handed weapon that can be up to elven in quality, and carries a small amount of gold. Ahtar will send you to kill him during his quest. Hargar's journal can be found on the table at the uppermost level of the wooden tower in Broken Oar Grotto, and will inform you of some hidden treasure near you. The key to the master-locked chest can be pickpocketed from him or looted from his corpse after he's killed. It is advisable to complete Ahtar's quest before any other quests in Broken Oar Grotto, as killing Captain Hargar will render that quest inaccessible, thus making it difficult to ever use Ahtar as a follower. Because you go to Broken Oar Grotto during the quest Lights Out, and Captain Hargar is always hostile, he will most likely be killed during the quest. This page was last modified on 3 September 2018, at 23:27.